U.S. Senate and House leadership have made it clear that one of the first items on their “To Do” list this January is to repeal the Affordable Care Act (ACA), despite having no plan to replace it. I know our health care system isn’t perfect, we still have a lot of work to do to make it more affordable for working families and to hold insurance and drug companies accountable. But repealing all the progress we’ve made without a plan to cover Montana families is reckless and irresponsible. That’s why I’ve been holding listening sessions throughout the state these last few weeks to get ideas and feedback about how we can build on the progress we’ve made to ensure our health care system work for everyone. I’ve also launched a webpage where Montanans can submit their personal stories about #WhatsAtRisk if Congress repeals the ACA without a plan to cover the thousands of Montanans who are benefiting from the law. 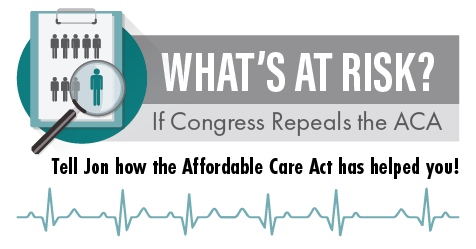 The ACA has provided rural hospitals a level of certainty they have never had before. Every day folks in rural communities rely on their local hospitals and clinics for everything from basic check-ups to emergency treatments. But if folks here in Congress take us back to the old health care system, they put these local hospitals at extreme risk. Take Mineral County Montana for example. The county is home to just over 4,000 Montanans. According to the Mineral Community Hospital CEO, a repeal of the ACA would mean the loss of the county’s only hospital. Without a hospital near the community, folks could be forced to travel 200 miles to deliver their baby or take an expensive air ambulance ride for a broken arm. These rural hospitals and community health centers don’t just keep the patients alive, they keep communities alive as well. A repeal of the ACA would kill rural hospitals — which could mean the death of rural America. I met with women in Great Falls last Monday to discuss the potential impacts repealing the ACA could have on women’s health. Insurers would be allowed to charge women out-of-pocket for contraception, well-woman exams, and mammograms. Women would lose certain protections against being charged higher premiums than men. Repealing the ACA puts everyone at risk, but seniors are particularly vulnerable. That’s why I sat down with seniors in Helena last Wednesday to talk about what’s at risk for folks on Medicare if Congress rolls back our progress on health care & takes us back to the old system. Medicare would face insolvency within a few years. Seniors would lose help paying for their Medicare prescription drugs. Insurers would be allowed to charge older Montanans many times more for their premiums than younger Montanans. This week I met with leaders of RiverStone Health in Billings and the Bullhook Community Health Center in Havre to discuss how repealing the ACA would impact these crucial organizations. Montana providers would face a jump in uncompensated care and bad debt, jeopardizing small community hospitals. The Community Health Centers (CHC) that serve over 100,000 Montanans a year would face the loss of 70% of their funding. We need to figure out a way to make health care accessible and affordable, but what we can’t do is repeal health care for 20 million Americans without any plan to cover these families. There’s too much at risk to play politics with the health of our state and our nation. If you have questions, comments or concerns about the uncertain future of health care in Montana, you can submit your personal health care stories at tester.senate.gov/aca. Senator Jon Tester is a third-generation Montana farmer, a proud grandfather and a former school teacher. He is the senior U.S. Senator from Montana.